A magnificent home with spectacular views and built with the highest quality materials. Situated in a unique position offering total privacy and tranquility, this property enjoys uninterrupted views towards the Mediterranean Sea and the coast of Africa. The villa consists of a total of 6 bedrooms and 6 bathrooms, all ensuite and all with unique views and total privacy. The entrance hall and sweeping staircase create an air of grandeur on arrival. The ground floor comprises of a large and exquisite drawing room with fire place and two separate seating areas. This room leads directly into the magnificent dining room which has high ceilings and stunning large windows making it bright and airy. The dining area leads through to a small but sweet bar area and eventually into the fully equipped kitchen and breakfast area. The kitchen boasts all mod cons and connects to one of the many outside dining areas with built in barbecue . There is plenty of storage space both in the large utility and pantry. 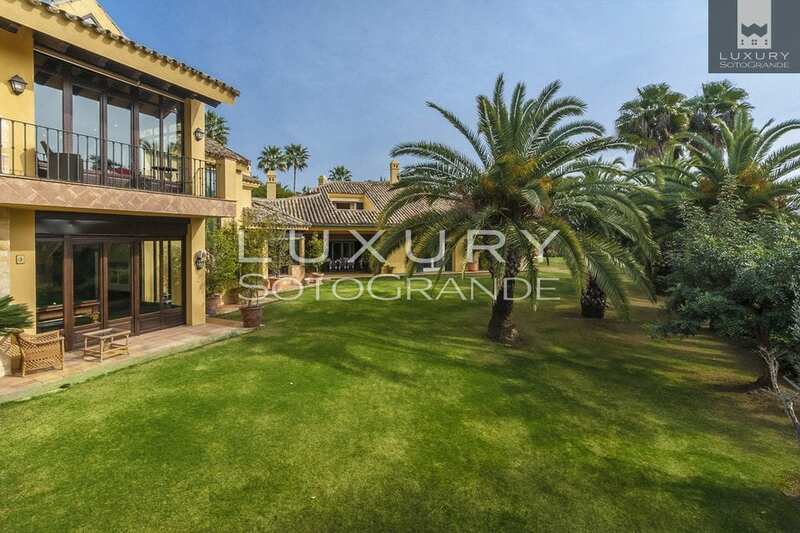 The main villa is connected to ´The Folly´ a beautiful addition to the house which hosts a spectacular wooden library with handcrafted built cupboards using rare wood and a games room / office that would rival many Gentlemen´s clubs. There is superb Bang and Olufsen surround sound and drop down cinema screen. To top it all off there is wine cellar that would be the envy of many top class restaurants. Back on the ground floor there are various covered terraces which extend onto the impeccable formal garden; which boasts many mature fruit and pine trees. The swimming pool is chlorine free, heated with an optional salt-water system with a pool house and gymnasium and separate sauna. The house is built on three plots and is ring fenced by an additional five plots to ensure the views are never compromised and maintains absolute privacy. There is a fully equipped security system in place covering the entire plot and house.